Continue reading for more about their menu and details of the day…. A huge thank you must go to Craig for his assistance and guidance throughout. His professionalism and attention to detail were second to none and I had the utmost confidence in him looking after our special day, of which he certainly delivered on! 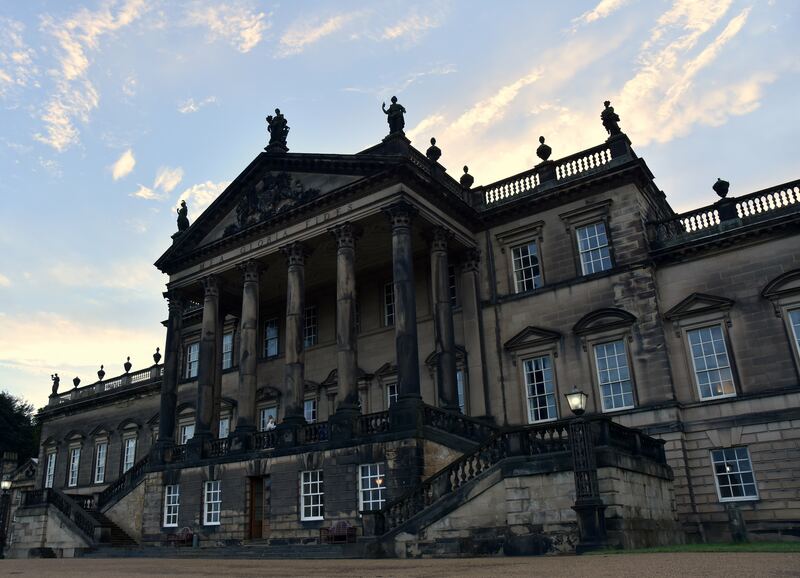 Nicola and Richard started their wedding journey with Dine in January 2015 and quickly fell in love with Wentworth Woodhouse for their wedding venue. This lovely couple chose a traditional wedding style with sage green and champagne accents to compliment their theme. Canapés were served in the Pillared Hall on arrival; we arranged for pink up-lighters to be installed, which created a really romantic back drop to their drinks reception. Guests were then taken into the Grand Marble Saloon where they were seated for dinner – this room was later transformed to accommodate an additional 78 guests for the evening reception. 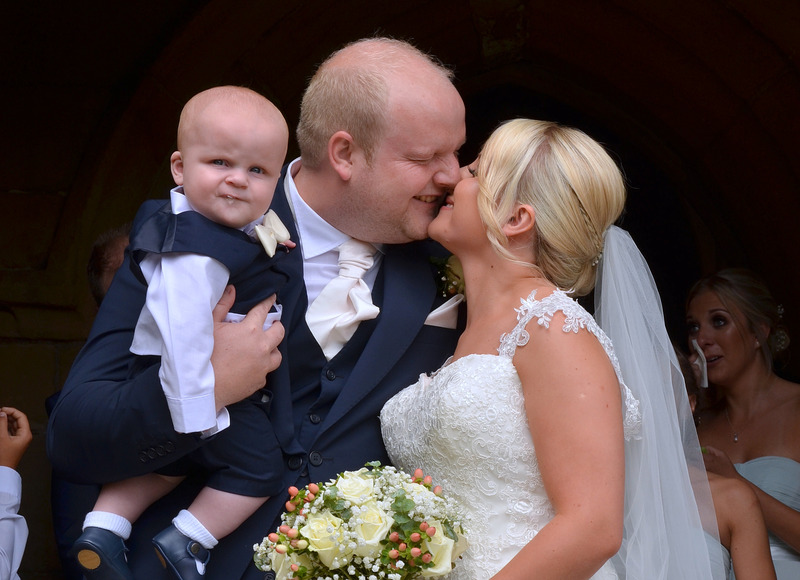 The Couple: Nicola Louise Taylor, age 28, HR & Operations Manager and Richard Terence Elliott, age 30, I.T Consultant live in Grenoside, South Yorkshire – with their gorgeous little boy Isaac. The Proposal: On New Years Eve/ New Years Day 2012/2013 as the clock struck midnight, Richard popped the question and Nicola of course accepted! 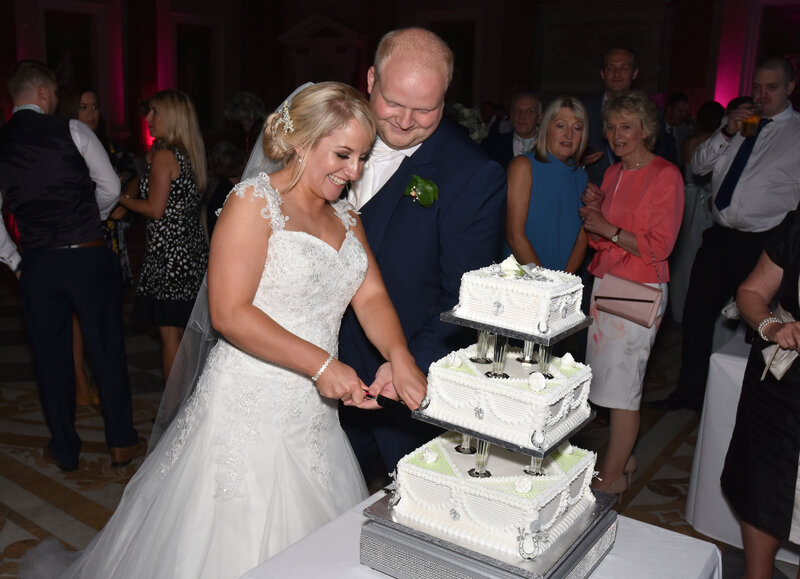 Nicola and Richard celebrated their wedding on the 20th August 2016, with seventy-one of their closest friends and family; we were fortunate enough to be involved in the preparation and delivery of this momentous occasion. The lovely couple decided to get married in Ecclesfield Church at 12 noon, a traditional wedding ceremony; guests were then shuttled up to Wentworth Woodhouse in a stylish vintage bus, where they welcomed their guests into the Pillared Hall, for a drinks and canapé reception. 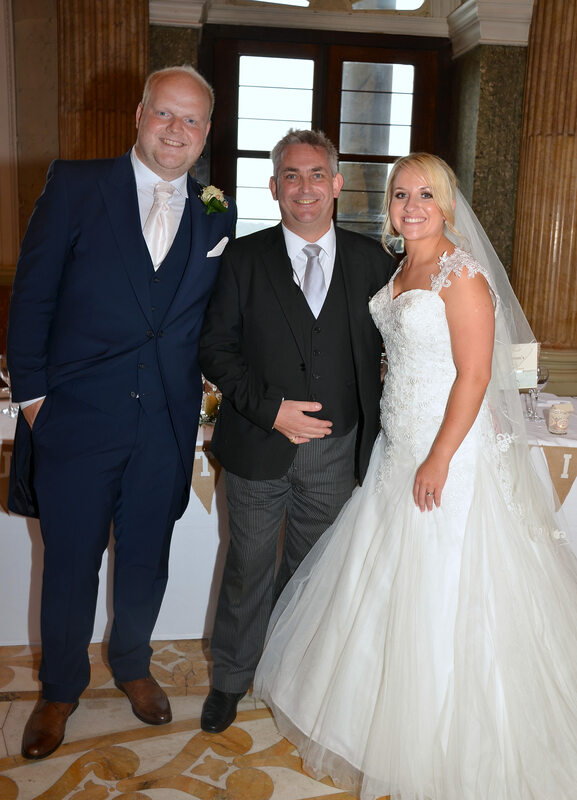 Nicola & Richard first got in touch with Dine in January 2015; after their tour of Wentworth with Craig (Head of Events at Dine), they knew that this was the venue for them. In April 2015, they booked their wedding with Dine at Wentworth Woodhouse, and from that point forward we took care of the planning of their special day. In the midst of all the excitement of their engagement, they welcomed baby Isaac into the world – a fabulous start to 2015! The cake: was made by Nicola’s Mum! A three tier traditional fruit cake, iced with white and sage green icing to match the bridesmaids dresses. 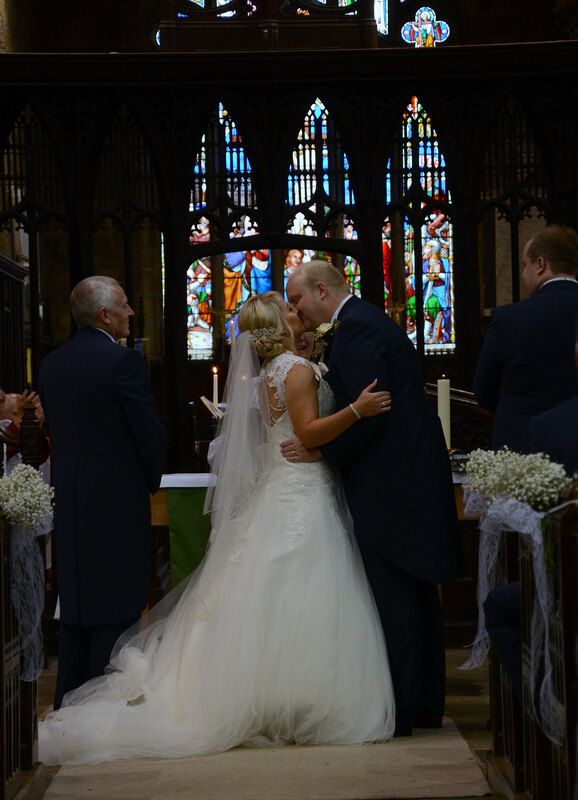 Nicola’s most memorable part of the day: “When the vicar announced we were husband and wife! 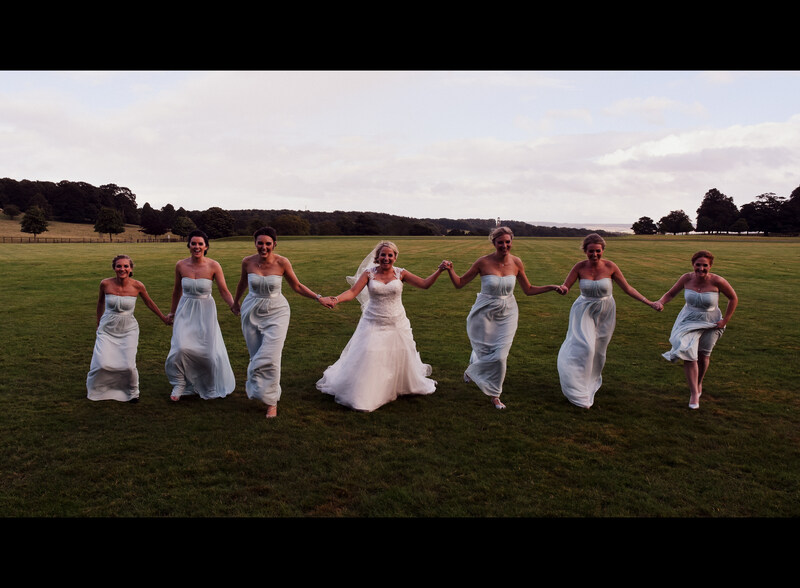 And then the drive from Ecclesfield down to Wentworth and not believing this day had finally come after all the times we had visited in the run up!” Richard’s fondest memory was seeing Nicola walk down the aisle – of course, because she looked absolutely beautiful! If you would like to know more about holding your Wedding or Event at Wentworth Woodhouse, take a look at our venues page for more images and venue details. Wentworth Woodhouse is licensed for Civil Ceremonies, and has a choice of fabulous rooms in which to hold your Wedding Breakfast and Reception. Call now to speak with a Dine Event Manager and arrange a time to see this beautiful venue – 0345 450 4545.